Somewhere between 100 to 200 people gathered at Milnrow for the ‘God’s glory, our Joy’ conference this year, held on a Friday evening, and all day Saturday, in October. 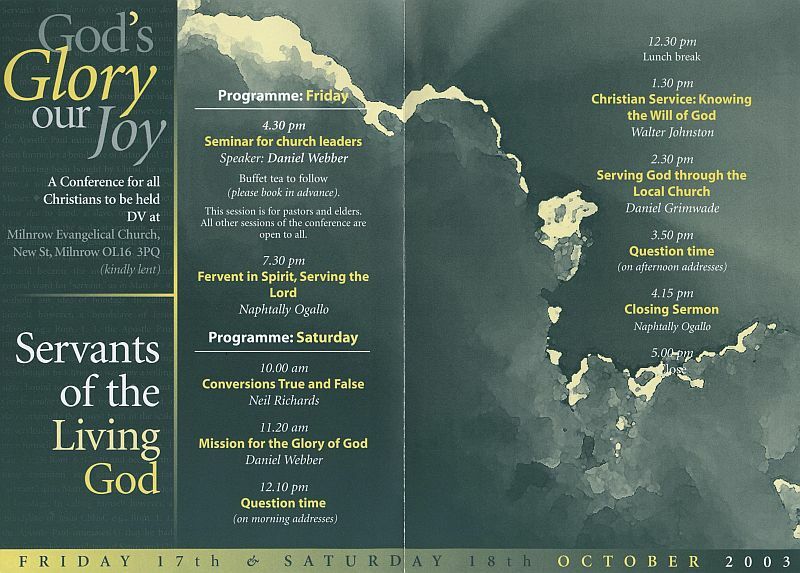 Below are brief tasters of the Saturday of the conference. Neil Richards was the first on the programme. A retired pastor, he gave us the benefit of his experience speaking on True and false conversion. He first spoke about true conversion, giving the two ‘ingredients’ as repentance and faith, and defining these two. He firmly asserted that repentance and faith are all of grace, being a fruit of the prior divine work of regeneration in the soul. He then went on to look at false conversion, using Charles Finney as an example of how defective theology leads both to defective methodologies and to false spiritual experience. Finally, drawing on Jonathan Edwards, he touched on the evidences of conversion and what should/should not convince us of the genuineness of a profession of faith. Daniel Webber (director of the EMF) was in magisterial form, talking on a subject about which he ought to know a great deal- The importance of mission. He showed us from history that the advance of the Gospel has always been the work, and the great concern, of a sovereign God. He then argued that God’s chief instrument in this work is the local church. From these two premises, he concluded that the local church should make a priority of evangelistic work. Walter Johnston (pastor of Chorlton Evangelical church) spoke in his usual straightforward manner on Christian service: knowing the will of God- about how we know what God wants us to do in order to serve him. His answer to the question was very simple. To attempt to summarise his message in a sentence, we are bound by the doctrines, commands, prohibitions, and principles of the Word of God, and beyond that, we are free. He held Jesus up as our example, as one immersed in the Scriptures and living according to the will of God by submitting to their teaching. Daniel Grimwade (pastor of Thornhill Baptist church) was well worth hearing. His subject was Serving God in the local church. He first pressed home the importance of Christian service, and the privilege it is to serve a master like ours. He then moved on to say that service should be done for the building up of- and as members of- the local church, and to show how this affects the character of our service. Memorably, he drew several vivid pictures of people we recognise in others and ourselves- Mr. Free-Wheeler, Mr. Come-to-Listen, Mr. Big Ego, Mr. Martyr, and Mr. Worm. 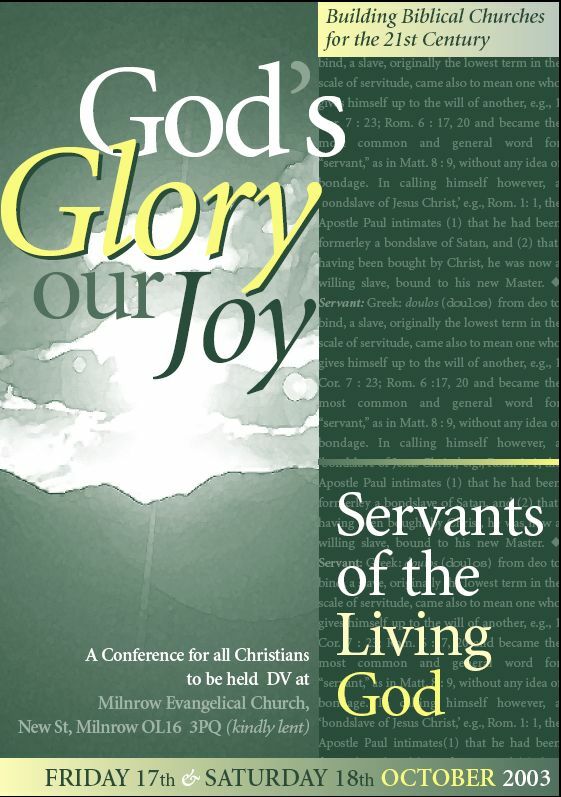 Only attending for the Saturday of the conference, I missed Naphtally Ogallo’s opening address on “Fervent in spirit, serving the Lord”. If was as good as his closing sermon, then it would be well worth getting the tape. He preached about how the world will try to stop our service, choke our zeal, seduce us away; and of how foolish we would be to allow that to happen, since nothing the world offers will either last or truly satisfy, whereas the love of God in Christ satisfies fully and lasts forever.